Here at Venesta we’re always aiming to develop and refresh our services to ensure every Venesta experience is a good one. With that in mind we’ve created a one-stop shop with all the spare and replacement parts you might require for your washroom area. 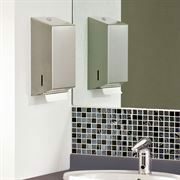 Browse our inspiring range of accessories from premium right through to budget or our replacement parts unique to your Venesta Washroom. Search by range, fitting or accessory. If your project requires a complete washroom cubicle system, IPS panelling system or vanity unit then click the link to visit the main Venesta website or call us on 01474 353 333 for more information.